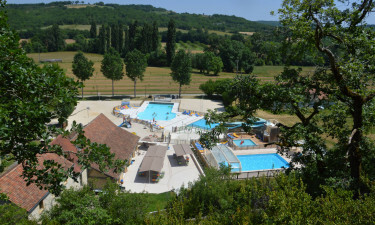 Le Moulin de Paulhiac luxury camping site is perfectly pitched in the rustic region of the Dordogne domain. This family holiday destination is a firm favourite for many as it runs alongside the stunning Ceou valley, with its resident river and rich, rustic landscape. If you seek restful seclusion with excellent amenities and a child-friendly atmosphere, contact LUX-camp today to book your mobile home. Welcome to Le Moulin de Paulhiac Campsite. 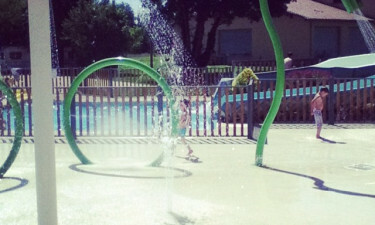 What is special about Le Moulin de Paulhiac Campsite? Set in scenic surroundings with access to river. Exceptional leisure pool complex suitable for all the family. Close proximity to many traditional French châteaux. Quality onsite facilities and amenities. 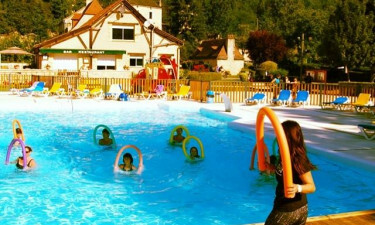 While you are not enjoying your mobile home, there is a lot to do on your camping holiday at Le Moulin de Paulhiac. The grounds have been structured around an eye-catching centrepiece, a tastefully restored watermill. The River Ceou conveniently runs along the bottom of the resort so families can have direct access. Chill out, relax on the riverbanks and breathe in the heady scent of walnut trees. If you fancy testing your angling skills, the river is conducive to fresh-water fishing and if you want to explore further you can rent a bike. Le Moulin de Paulhiac is all about luxury camping so you will be spoilt for choice when it comes to things to do onsite. There is a super swimming complex with no less than four pools to choose from. They are all heated and some are covered; there is also a small paddling pond for younger ones. There is a plethora of water features built into the spacious lagoons; water slides and playing apparatus. The surrounding terrace has sun loungers so parents can sunbathe while keeping an eye on the little ones. Evening entertainment includes talent competitions and live shows. 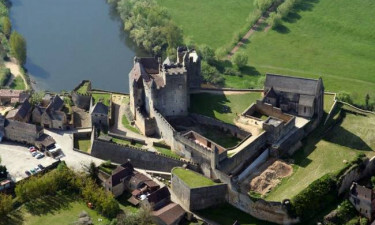 The Château de Castelnaud is in fact a medieval fortress that looks out over the Dordogne River in picturesque Périgord. It was originally constructed in competition with its opposing rival; The Château de Beynac. Today the castle has been lovingly restored and is privately owned. The castle clings to the side of a hill and has a long cobblestone climb to its doors. The breath-taking views from the top are well worth the effort. Inside there is a wealth of historical artefacts and information about the one hundred year war. 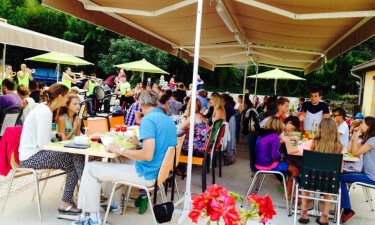 Le Moulin de Paulhiac camping site has its very own restaurant so you do not have to walk far when you want to dine in splendour. The restaurant offers a three-course menu to its guests and you can dine indoors or al fresco. There is a take-away meal service as well as a traditional pizzeria. In the resident bar, you can sit back and try out some of the traditional and local wines.